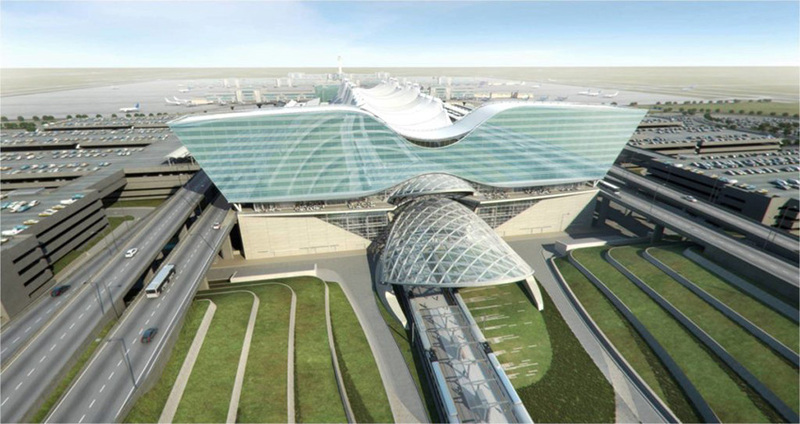 Denver International Airport (DEN) completed a five-year construction program to build a large-scale hotel and transit center complex next to the airport’s south terminal. The project includes a 519-room hotel and conference center, a new public transit station that provides commuter rail connections to and from downtown Denver, and an open-air plaza linking the hotel, conference center, and train station to the existing terminal. To improve project delivery and performance, and integrate BIM into its operations, DEN required the use of BIM for design and construction. This project was managed by HNTB and Parsons, designed by Gensler and under construction by MHS Tri-Venture (Mortenson, Hunt, Saunders) with enabling work provided by Kiewit. HNTB in collaboration with project partners employed Autodesk technologies to drive a BIM process from early stages of planning through design, and now into construction. HNTB guided the creation of virtual models of the existing and new buildings that were used for a variety of tasks such as spatial coordination, clash detection, structural design analysis, design review, visualization, collaboration, cost analysis, and construction scheduling. Model-based design and construction workflows are helping the team meet an aggressive project schedule, resolve conflicts virtually to minimize field rework, reduce errors and omissions, and improve project communication. In addition, DEN expects that its investment in ‘FM-ready’ project models will help produce a significant return on project performance and energy conservation. The airport’s existing south terminal is covered by an iconic fabric roof supported by a steel cable system with tie-downs that maintain cable tension and anchor the roof to the ground. The roof moves vertically up to 18” due to weather conditions and the new hotel, which connects to south façade of the terminal, must accommodate this vertical movement. In addition, construction of the new facility requires the displacement of six of these roof anchors. The designers used integrated virtual models to analyze these systems holistically, devising strategies to temporarily remove the supports without compromising the existing roof and re-anchor the supports permanently around the new building. Model-based visualizations and simulations were used throughout the design process for design reviews, spatial coordination, and clash detection. In early stages of design, simulations helped the team optimize the design for ticketing, security, and egress. Energy analyses and simulations of lighting conditions enabled the team to achieve a greener design for the project, which is on track to meet LEED Silver certification. Part of the early effort involved capturing the existing conditions, above and below ground for the interface of this new construction project with the existing building. The integration of the point cloud into the model, along with survey data, assured an accurate building location. The data capture of the Terminal Building included LiDAR scanning of the first three bays from the roof down to the ground. The scan assisted modeling the building to a high level of detail with everything modeled down to 6” in size. Using LiDAR to model the interior took place over three evenings (1 a.m. to 4 a.m.) with 60 to 80-foot scans. The scan data was compiled into a digital image, and from there it took four to six weeks to create the full model of the existing building. With such a large job site and a coordinated central model, making the model accessible to the workers was always a goal. Given the issues with unwieldy plan sets, the contractors were willing to try electronic file sharing with iPads. Just think of the guy checking re-bar up on level five, and the amount of time it takes to walk down five flights of scaffolding, walk 1,500 feet over to the trailers, try to sort through plans to find the one with the detail he is looking for, think through it, and then make that return trip. He has that model in his hand on an iPad, with the detail he needs, looking right at the install and seeing if it matches the model, and doing that within minutes. Simple analysis like that bears a lot of witness to the benefit of the integration of technology in our everyday work. Mark Hughes, AECOM. 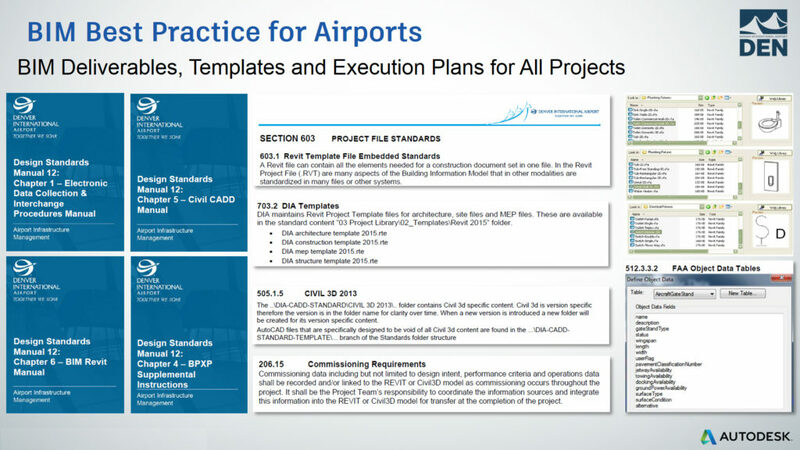 The airport uses CAD, BIM, and GIS on a regular basis for a number of different operations. GIS is the ‘repository of truth’ for deliverables to the FAA, and to provide the less granular view of the world. 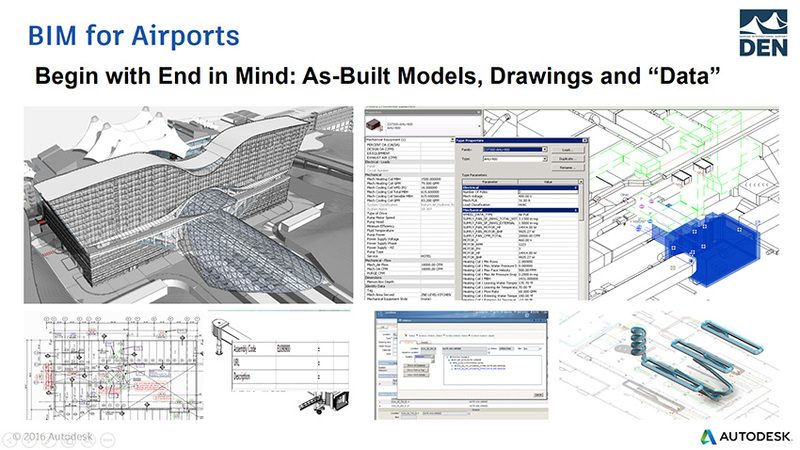 New information is provided by BIM platforms (Civil 3D or Revit) for authoring. In addition to being the authoring tool, BIM is also platform used to integrate all building infrastructure. Maximo is used for facility management. To continue to maintain the sync of these systems, there are bi-directional updates to all systems on a regularly scheduled basis. For the airport, it was really about reducing redundancy and carrying the building model throughout the whole lifecycle of the project. Their push toward BIM for maintenance is strategic for long-term benefits. This building effort was the first step in a conversion of the whole airport into using the BIM model as the primary source of data for facility management. Fully implemented, DEN personnel will have access to BIM information on when an item was purchased, the cost, the item’s specific location, when it was installed, the maintenance schedule for the item and other information important to maintaining the airport facilities. And BIM will continue as the primary author tool for new and ongoing projects. The model will be used for maintaining the critical systems that run the airport: mechanical, electrical, plumbing and security. The process is about creating a detailed model that informs all ongoing actions, and not on creating visualizations. One key element of a successful BIM implementation is having a plan and specification to follow. Denver is now in its 3rd generation of BIM execution planning, standards, and deliverables. Denver has gone further in developing their own BIM (Revit and Civil3D) intelligent objects, metadata and FAA requirements for all the work that gets planned, designed, constructed and operated. All in all, to get the BIM results you want, you need competent BIM practitioners and a way to measure execution and results against Key Performance indicators (KPI’s). One thing that makes a BIM implementation successful is beginning with the end in mind, which is exactly what DEN did. Here we see some of the Revit models, elements, and templates that DEN created for their designers, contractors, and asset management consultants to use. You can see that all the metadata fields have been created ahead of time so that as information is added to the model through construction, commissioning and handover, the airport owner gets a fully populated intelligent model that contains all drawings, details, objects, history and operational parameters for the lifecycle. Doesn’t happen by accident.